If November 9 is a piece of poetry, it would have been an epic. If it is a song, it would have been the global anthem on the lips of everybody. In the history of the world, most astonishing events that have improved life on planet earth are somewhat rooted in the 9th of November. Let's take the year 1620 for instance when the Pilgrims aboard the celebrated Mayflower sailing ship landed at Cape Cod, Massachusetts, turning the historic journey into a success story, as it positively affected the cultural, historical and economic well being of present day United States of America, ranking as the second most successful migration from England to America. In 1697, Pope Innocent XII founded the city of Cervia, now a seaside resort in the Adriatic Riviera of Central Italy. To engender peace development in Europe, Spain, France and Britain in 1729 signed the treaty of Seville which ended the Anglo-Saxon Wars and further led to the treaty of Vienna. How many people are aware that the Atlantic, a geographical historical beacon has a strategic link with Boston Massachusetts in 1857? This is equally true of Theodore Roosevelt who in 1906 was the first sitting president of USA to make an official trip outside the country to inspect progress on the construction of Panama Canal, a historic construction that bridged the Atlantic and Pacific Ocean, shortening navigation by thousands of nautical miles. In more recent times, it was in 1989 that a process that led to the fall of the Berlin walls, separating Communist East and democratic Western Germany began. In births of enigmatic people, November 9 stands like a giant as people born on this day have been movers and shakers of the world who have come to improve rather than be watchers. In 1877, Enrico de Nicola, an Italian politician, first president of Italian Republic was born. Joseph Adolphe Chapleau, Canadian politician who became the 5th premier of Quebec Region, Canada, adds to the list of November greats. The above is the same of Giles Gilbert Scott, born in 1850, English Architect who designed the Red Telephone Box that became symbolic of Britain. There are others like Ronald George W. Norrish, English Chemist who won the Nobel Prize in his field, Spiro Agnew, American 39th vee pee, the deputy of the famous Richard Nixon of the water gate fame, whose birth was recorded in 1918. Not only males, there are females in different fields like Anne Sexton a celebrated American poet. As holidays, Germany, Austria and Switzerland revere same day as inventors' day. The historic festival, the Basilica di san Giovanni memorial feast has November 9 as the dedication day. Taking inference from astrology- that old science associated with the 3 wise men who located baby Christ, Scorpios of November 9 are adventurous and always on the lookout for new experiences. According to Wikipedia, 'they seem to be constantly in motion, involved in new challenges. They live life on their terms. They don't mind making mistakes as long as they learn from them. They have great curiosity and never stop investigating the world around them. November 9 people are good at making their relationships work. In romantic relationships, they take the initiative – they go out and look for true love! Once settled in a committed relationship, they are content to remain in it forever. November 9 people generally have a philosophical view concerning the past. They don't obsess over what may have been lacking in their childhood. People born on this day have the wisdom to understand that they can't fight their children's battle for them; they can only stand by and be supportive. November 9 people have a balanced temperament, which has a lot to do with their good health which is a plus for leadership. People born on this date are interested in careers that provide excitement and new experiences. They often opt for work that involves physical labour and a change of scenery. They may change careers several times, eager to expand their horizons and meet new people. They can turn a modest investment into a money maker. As seen above, Abia people have benefitted immensely from November 9 people. 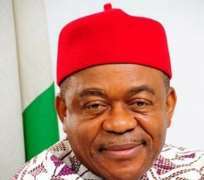 The transformation, foresighted leadership of Chief T. A. Orji has a bevy of legacies that are people oriented. The year 2007 when he mounted the saddle is a far cry from 2013 with monumental changes in all spheres of life. The health sector is reborn with installations that have made Abia a medical pilgrim's delight. Is it with the diagnostic centres and its dialysis machines, eye and chest units and multiple specialist and general hospitals or the Primary Health Centres numbering a total of 710, pushed to this number by additional 250 constructed by the administration of Chief Sir T A Orji. May be more like the various medical missions of his and the Abia First Lady that have screened women for cancer, offered supportive tips and ARVs to HIV-AIDS patients, fitted amputees with prosthesis and bankrolled consultants who mentored non-infectious disease sufferers like diabetes and high blood pressure. Equally, eye sights have been improved by offering thousands of eye glasses and multiple eye operations of all in Abia irrespective of tribe and tongue. In Education, outside making tuition free in primary and secondary schools, the first set of pupils and students who have been in school from primary 1 and JSS1 in 2007, enjoying free bus scheme all through have jumped off the bus with certificates folded in their armpits not paying a dime. Many bold steps and policy decisions of Ochendo have proven critics wrong. The carnage on our roads and collaborative crime ensconced by motorcycle operators were dealt deadly blows with a final and total ban. Despite uniformed resistance of traders in Ogwumabiri Umuahia, the Timber market and the spare parts of Mgbuka are now happily quartered in more descent and sound locations of Ubani, Azueke and Ohiya respectively. The oil producing of Ukwa have a soothing balm in ASOPADEC. The ASUBEB, planning commission, Ministry of Agriculture are all involved in a synergy of multiple interventionist activities of construction of school blocks, varying poverty alleviation programmes, and the procurement of one Billion naira loan project for Abia farmers. Have we forgotten the upscale youths who are into life improving skills acquisition and recipients of 600 free empowerment vehicles? The systematic liberation of the totality of Abians from a political stranglehold that nearly choked lives out of them and the swift but tenuous extrication from hydra-headed security challenges of armed robbery and kidnapping are very difficult experiences too hard to forget even at gunpoint. The proposed airport, networks of unimaginable number of roads crisscrossing the landscape of Abia and the monumental Improvement on Abia environment, especially Aba, are things we cannot ignore. He is working tirelessly as if he is going for third term. We can go on and on with the legacy projects in Ogurube layout starting from the magnificent BCA complex, the cascading roofing structure and the multiple pillars of the commodious International Conference Center that could make the Greek acropolises green with envy. Not done, the imposing new Government House, the new Secretariat, ASEPA House and all are too obvious to be mistaken. Space may not allow me to continue. On all counts, November is good for Abia, judging from the monumental achievements of Ochendo. We can recall that late Dr. Nnamdi Azikiwe, Rear Admiral Ndubuisi Kanu, President Goodluck Jonathan, Babangida Aliu Muazu of Niger State, to mention a few are all accomplished November people. We cannot but join others in wishing our ebullient helmsman, the great November personality of our time, Chief T. A. Orji a Happy Birthday.